Hai semua!!! 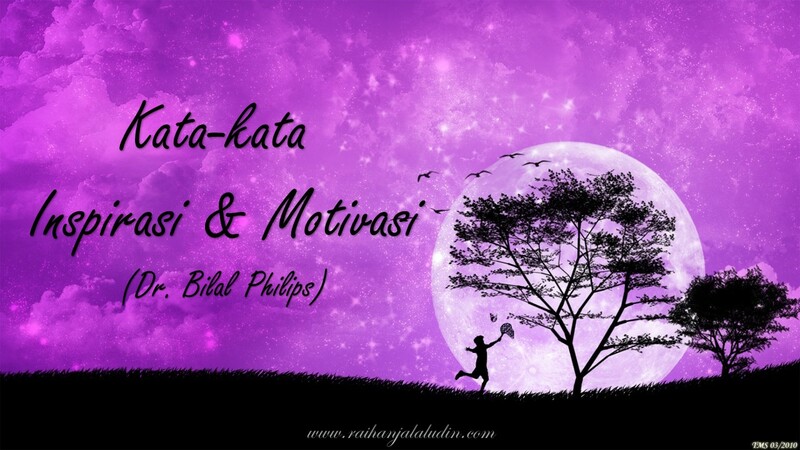 Saya merupakan salah seorang follower Dr. Bilal Philips di FB. Saya sangat sukakan cara beliau berdakwah... Dengan kata-kata yang menginspirasikan dan very straight forward message yang disampaikan olehnya mampu menjadi santapan minda yang berkesan kepada seorang Muslim. Post beliau sering mendapat jumlah like dan share yang tinggi. 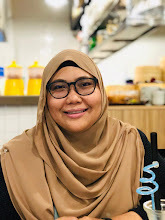 Saya sendiri selalu berkongsi status beliau kerana pada saya tulisan beliau bukan sahaja berunsur nasihat dan telus tetapi amat menginspirasikan! 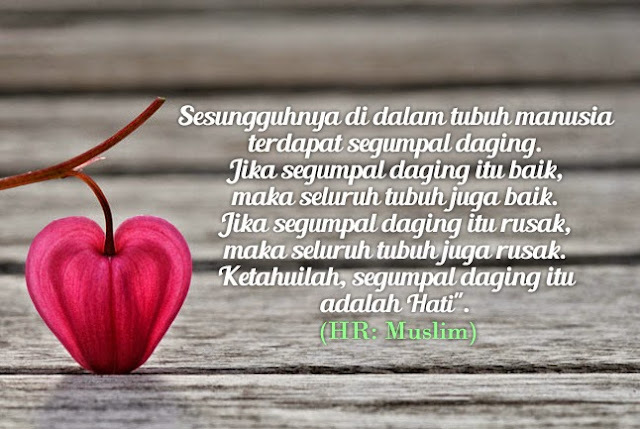 Berikut adalah kata-kata beliau di laman Facebook yang saya kumpulkan sejak beberapa bulan yang lalu... Sangat positif dan dapat memotivasikan saya dikala saya down. Hehe.. Peringatan untuk kita lebih dekat dengan Allah yang maha Esa, mengingatkan diri supaya bersabar dengan ujian dan masalah yang menimpa, memujuk hati dikala lara serta menjadi kata-kata perangsang untuk menempuh liku-liku kehidupan di dunia yang fana ini... Jom baca! Don't see bad things as problems. See them as lessons. Maybe without them, we won't be able to learn and grow. You cannot be free while you are attached to your worries, freedom comes when you give them in prayer to Allah. People hurt you. Allah will heal you. People humiliate you. Allah will magnify you. People will judge you. Allah will justify you. If they respect you, respect them. If they disrespect you, still respect. Don't allow the actions of others to decrease your good manners. Sometimes it is better to just let go. Maybe it was not in Allah's plan for you. He has something better in store for you. Trust Him. Oh Allah, give me hope when I despair. Pick me up when I fall. Put my pieces back together when I'm broken. Protect me always. Aameen. It is time to let go off the past. Make way for the good that Allah has in store of you and be thankful to Allah for it. This dunya has been designed to break your heart. If you are looking be to be happy here, you are in the wrong place. One day, you'll be just a memory for people. Do your best to be a good one. No matter what position you're in never think you're above anyone else. Humble yourself and don't forget that your worth comes from Allah! If Allah has written happiness for you, no one can steal that from you, and if He has written for your heart to break, then no one can mend it but He, so always put your trust in Allah! “Never think you can choose better for yourself than Allah can. It is He who created you; it is He who knows what is best for you. Be confident of who you are. You are a unique person in your own way, treading the path to Jannah. If others have a problem with you for no obvious reason, then that is their loss! Having complete trust in Allah is such a stress reliever. Because when you don’t get what you want, you just know Allah has a better plan! When you're broken, when you're hopeless, let Allah help you, change you, and make you strong. Always remember Allah. Never doubt the mercy of Allah. He can take us out from the deepest of troubles. Never lose hope. Pride is concerned with WHO is right. Humility is concerned with WHAT is right. Stay humble and earn the love of Allah. Don't put a question mark where Allah has put a full stop. He knows better. Allah's timing is perfect in every matter. We don’t always understand the wisdom behind it, but we have to learn to trust it. Oh Allah, if I hurt others, give me the strength to apologize. If people hurt me, give me the strength to forgive. Just because you don’t see ease in front of you does not mean it is not there. Perhaps, you are looking at the wrong door when Allah has opened multiple pathways towards ease and prosperity. If you’re still finding it difficult to find the right door, beg Allah to show you the pathway that leads to ease and peace, because sometimes, you have to ask in order to gain. Death does not concern us, because it is not yet here. But when it does come, it will be too late to be concerned. O Allah! I need you more than ever. Respect people’s feelings. Even if it does not mean anything to you, it could mean everything to them. Keep praying even if you only have a whisper left. He hears it all! Sometimes struggles are exactly what we need in our lives. If Allah allowed us to go through our lives without any obstacles, it would cripple us. We would not be as strong as what we could have been. Sometimes hardships are blessings...Allah is with those who have Sabr. The Reward of Sabr is Jannah. People will sacrifice sleep to be successful in this world, but people won’t sacrifice sleep to be successful in the next world. You will find that Allah has given you things without asking, so have trust in Him; He doesn’t withhold, except for your benefit. Stop looking for reasons to be unhappy. Focus on the blessings you do have from Allah, and you'll find plenty of reasons to be happy. Fear Allah at all times, especially when you're alone. We can hide from people, but we can't hide anything from the Al-Baseer, the All-Seeing. Who will aid you if Allah forsakes you, and who can harm you if Allah protects you? Please Allah, everything will fall in place. Those who love Allah, make time for Allah. Nobody can shut you down, lock you out, or block you from what Allah has decreed for you. He opens doors for you that no one can close. Learn to be happy and wish happiness for others. Don't be jealous when others have more than you. Be grateful and He will grant you more. Accept and be happy for what Allah has blessed you with, it may be a small thing but to others, that small thing could be their biggest dream. Ya Allah! Forgive us for our weaknesses and shortcomings. Remove from our hearts the love of everything that You do not love. Ameen. How strange is the human, while making dua he thinks Allah is very near and while committing sins he thinks Allah is very far! Allah’s timing is perfect in every way for every matter. We never understand the wisdom behind it, but we have to learn to trust it. Relax. Allah saw your situation coming long before you did. He’s STILL in control. :) Alhamdulillah. If Allah takes away someone from your life, be patient. There is good in it which you cannot see now or maybe you will not see it ever. Hold onto the truth that what Allah does is ALWAYS for our benefit and wade through life. You will find happiness if you place your trust in Allah in much better things, in shaa Allah. The best cure for worry is to surrender it all to Allah. Don't cry for your loss. Allah won't take anything from a believer without replacing it with something better. Whenever you lose hope, remember the story of Prophet Yusuf. He was in the darkest pit of a well & Allah made him the most powerful man in Egypt. Have faith in Allāh ﷻ. Always remember that Allah's decisions are better than your wishes. Being positive doesn't mean we deny the existence of our problems; it means we believe Allah is greater than our problems. Sometimes the best thing you can do is not think, not wonder, not imagine, not stress. Just breathe and have faith in Allah that everything will work out for the best! Don't be sad. Pain in this dunya is temporary, handle it with Sabr and inshaAllah a greater reward awaits you. Allah is with the patient. Don't care about how many people may get mad at you for doing the right thing, because they won't be standing with you on the Judgment Day. Always pray that Allah makes you satisfied and happy with whatever He has decreed for you. Never underestimate the power of a smile, a kind word, a listening ear or a compliment. All have the potential to make someone's life better. Allah will never leave you empty. He will replace everything you have lost. If He asks you to put something down, it’s because He wants you to pick up something greater. Don't focus on the trials you are facing, but the benefits and lessons you are learning. Worry increases pressure whereas prayer releases peace. He who kneels before Allah can stand up to anything. If you've been hurt, offended or disappointed, learn to let it go. It is not good to hold on to negative feelings which affect your own peace. People will not always be there for you as you want them to be there. Don’t get hurt when someone didn’t act the way you wanted. Embrace your loneliness and be strong. Rely on Allah subhanahu wa ta'ala. Turn to Him and He will surely respond. Allah answers the prayers you never even made because He already knew what you needed - even when you didn't know yourself. When we say "I cannot" to any of Allah's commands, this is not correct as Allah HIMSELF says He does not burden us more than we can bear. Make Dua, do your best and leave the rest to Allah. We often wonder why we didn't get what we want, but we need to realize that sometimes Allah keeps something away from us in order to give us something better. If Allah brought you to it, Allah will bring you through it! Even when everything is not going right, don't ever despair in the mercy of Allah or underestimate His power. Allah only has to say "Be", and it is! Always be kinder than necessary. What goes around comes around. No one has ever made themselves strong by showing how small someone else is. Sometimes, it’s just better to place your head down on the hard concrete floor - in sujood - and pour every single worry, fear and grief to Allah, rather than worrying about every minute that you’re going to face in the future, because it is He who controls the future, and He alone can set things right for you. Why worry when you have Allah with you? People will enter your life and leave your life, the only constant is Allah, so assess your life to see which way you're headed - towards pleasing Allah or pleasing people? Make it your life mission to help others in any way possible without wanting anything in return. Be selfless. Your reward lies with Allah! If you’ve been depressed with all the challenges you’re facing on a daily basis and see no way out, ask yourself this -Do I spend more time worrying about my trials or do I spend more time making dua for ease from your trials? The answer to this can solve most of your problems, because what you cannot do, DUA can! The next time you feel proud when someone praises you for your amazing work, be it in whichever field, remember the source of the blessing. Remember that even if you worked hard for it, if Allah hadn’t hadn’t beautified it in the eyes of the people, your work would have never been recognized at all. So at every step, remember to be grateful for Allah likes the ones who are humble and grateful. Don’t be sad because Allah sends you hope in the most desperate moments. Don’t forget; the heaviest rain comes out of the darkest clouds. When you need something, He knows. When you ask, He listens. When you're thankful, He blesses more. Whatever is worrying you right now, forget about it. Take a deep breath, stay positive and know that Allah will make things get better. When you are at your lowest look up and pray to the Highest. Rely on Allah Subhanahu wa ta'ala for everything that you want in life and HE will give you in the best possible way that you never imagined. Be thankful for your blessings and never doubt your struggles. Don't ask why they happened, just be thankful for the strength they gave you. Allah has a plan. A plan far greater than you can imagine. Stop worrying, stop stressing, and trust Him! Clothing yourself with the best character is more appealing than clothing yourself with expensive labels! No matter how many prayers you have missed, don't miss the next one! The Haram path is easy and tempting but remember the price of Jannah isn't cheap.